If you’re after a Nintendo Wii this Christmas then you’d better get your credit card out - and maybe start brushing up your French too. A report by the Daily Mirror claims that British shoppers are donning their best French accents and sailing over to Calais, where the console’s reportedly ready to be had for just £150 (€210/$300). A spokesman for Calais store Micromania told the paper: "English interest is phenomenal." It's having to limit Wiis to one per customer, the Mirror claimed. In the UK, though, websites such as eBay have the console listed for sale with prices ranging from around £300 (€420/$600) to £1000 (€1300/$2000). One intrepid seller hoping to offload his Wii for £1m may be slightly overestimating the price people are willing to pay to get their hands on one of the consoles this Christmas though. What would you pay for a Wii? Alternatively, some companies with stocks of the console are targeting gamers by email, but with hugely inflated prices. 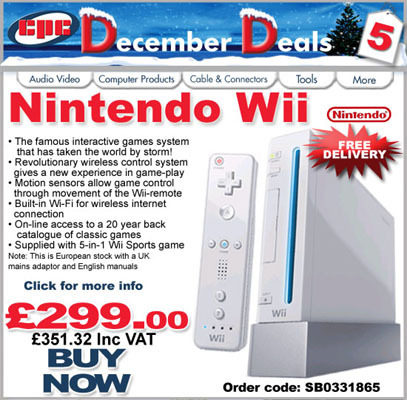 For example, dealer CPC sent Register Hardware reader Walter a "December Deal" email offering the console for £352 - without any games other than the standard Wii Sports bundle. The 'standard' UK price suggested by Nintendo is £180.